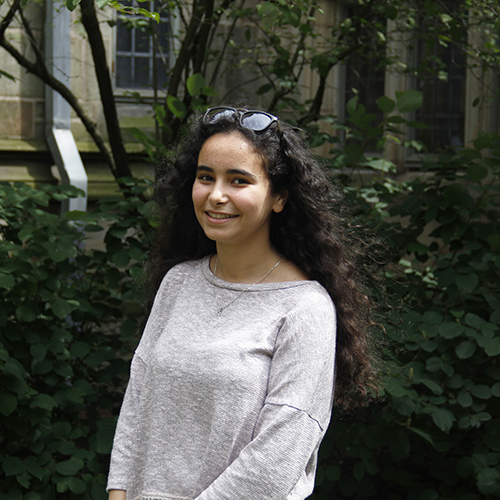 Nada is a Yale Young Global Scholars (YYGS) alumna who loves math and science. She decided to attend YYGS in order to take practical classes and grow her skill set, but she left the program with much more than that. She gained a new passion for technology and the inspiration to found a tech start-up to teach coding skills to kids interested in computer science. While attending the Frontiers in Math and Science session in the summer of 2017, Nada met students from different countries, many of whom learned coding at a very early age. During YYGS simulation activities, students were asked to use computer science skills. Nada recalls feeling unconfident because she had few computer science skills at the time. “We don’t study computer science in school, and we don’t have any place here where kids can learn computer science [from] good teachers. [The only knowledge I had was] what my brother taught me,” explained Nada. Her personal experience led her to realize the wider issue of unavailability of computer science education in her country, Morocco. “Our goal is to enlighten these children by giving them the opportunity to study computer science and apply to international competitions to show their skill. We believe in [the] kids’ potential,” says Nada. KidCode is currently active in Tangier, Morocco, but Nada plans to adapt this program to other cities in Morocco before expanding into Africa. “Our goal is to have our own centers all over Morocco by the end of 2020 and reach the maximum [number] of kids [we can],” Nada tells me.